by Dunham, Montrew, Morrison, Cathy, Underdown, Harold D.
Dunham, Montrew, Morrison, Cathy, Underdown, Harold D.
Ages 8 to 12 years. 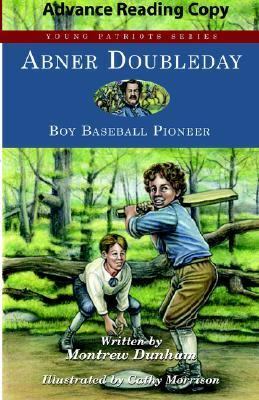 Young readers will share Abner Doubleday's enthusiasm and love of baseball and recognise him as a heroic general who fought bravely in two wars in this installation of the Young Patriots series. An early adapter of modern baseball rules, Abner adored the sport and helped bring it into mainstream American sporting life. As a boy, he loved nothing more than playing ball-whether it be 'one old cat' or 'three old cat'-with his brother and friends. When not on the playing field, Abner sought out adventures, which led him to a historic meeting with the French Revolutionary War hero General Lafayette, the recovery of a stolen trunk in the woods, and a hitched ride aboard a rickety stagecoach. Even as a child, Abner displayed the leadership skills and good sportsmanship that helped him advance the rules of baseball and lead his soldiers into battle during the Mexican-American and Civil Wars. Special features include a summary of Abner's adult accomplishments, fun facts detailing little-known titbits of information about him, and a time line of his life.Dunham, Montrew is the author of 'Abner Doubleday Boy Baseball Pioneer', published 2005 under ISBN 9781882859504 and ISBN 1882859502.